We will never forgot those who lost their lives on 911, ever. And nothing will ever replace the Twin Towers in the hearts of New Yorkers who saw them shining in the morning light or was overwhelmed by the view from the Observation Deck. 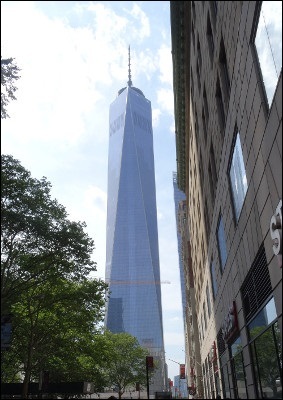 However, the new One World Trade Center is a visual work of art like none other, and we are happy to see it grace our skyline and remind us that lovers of freedom may fall, but others will rise up and take their place. The National September 11 Memorial Plaza - The 8-acre Memorial Plaza is a homage to the thousands who lost their lives on 9/11 as well as the WTC buildings themselves. 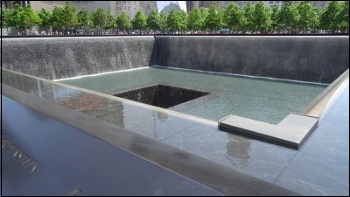 The Memorial Pools built in the original footprints of the Twin Towers are beautifully crafted with the names of the every person who perished during the attacks etched in bronze along the rim. The manmade waterfalls are a serene sight to behold that create a peaceful atmosphere for reflection on what the events of that day meant, not just for New Yorkers or Americans, but all peace loving inhabitants of this world. 911 Memorial Museum - Through the use of state-of-the-art multimedia exhibits, archives and monumental artifacts, the 911 Memorial Museum presents historical information that pays tribute to those who perished in the attacks, those who survived and those who continued to work at the site for months after that day. There's much to see, and the guided tours that take place daily really are informative and will enhance your experience of the museum. One World Observatory - See New York City and the surrounding area in all its glory from the 100, 101 and 102 of One World Trade Center. The elevator or "Skypod" that will whisk you 1,250 feet to the Observatory in 60 seconds is an amazing thrill ride. E train to the World Trade Center Station or the A, C, 1, 2, 3 to Chambers Street to Chambers Street. R R train to Rector Street Station. Take the M5, M20 or the M22 Bus. From New Jersey, take a Path Train heading for the WTC. The Twin Towers were completed in April 4, 1973. At the time they were the tallest buildings in the world with 110 stories standing at approx 1,368-feet-tall. The entire World Trade Center site cost $400 Million to build and took 10 years to complete. The original WTC complex had 13,400,000 square feet of office and retail space. On February 26, 1993 terrorist attempted to destroy the Twin Towers by setting off a truckbomb in the parking garage. Their plan failed, but 6 people were killed and 1,042 injured. On September 11, 2001 both the North and South Towers (One and Two World Trade center) were struck by jet airplanes in a terrorist attack. Both towers collapsed destroying the complex and nearby structures. 2,977 innocent people lost their lives during the terrorist attacks on 911. They will never be forgotten.